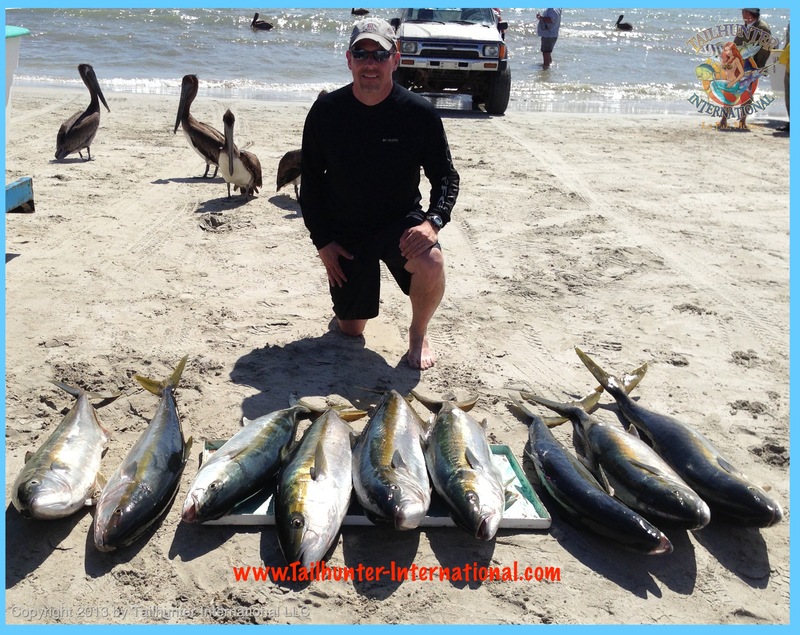 Crazy good yellowtail fishing this week…the best of the year. 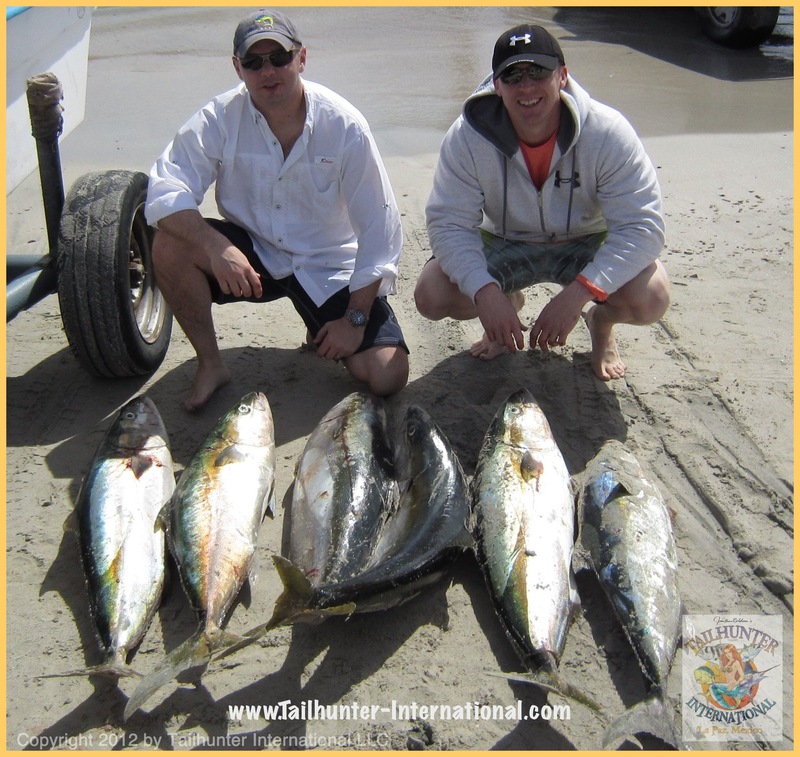 Brian O’Niel and Leif Dover came out to fish with us from Atlanta GA and timed a week’s worth of fishing just right hammering 6 ‘tails and losing 2 on their first day out…just as the bite started! 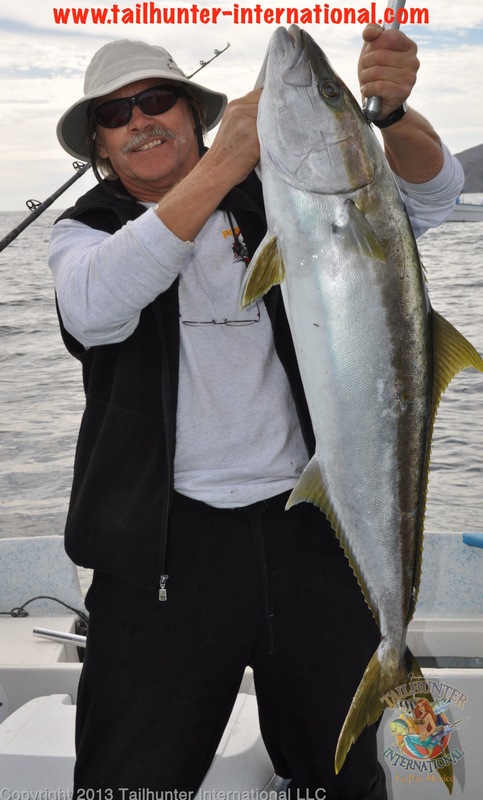 Recently retired Darrell George kicked off the “easy life” the right way coming out to fish with us from New Mexico with his dad and they also got into the big yellowtail bite with fish up to the 40 pound class off Cerralvo Island. 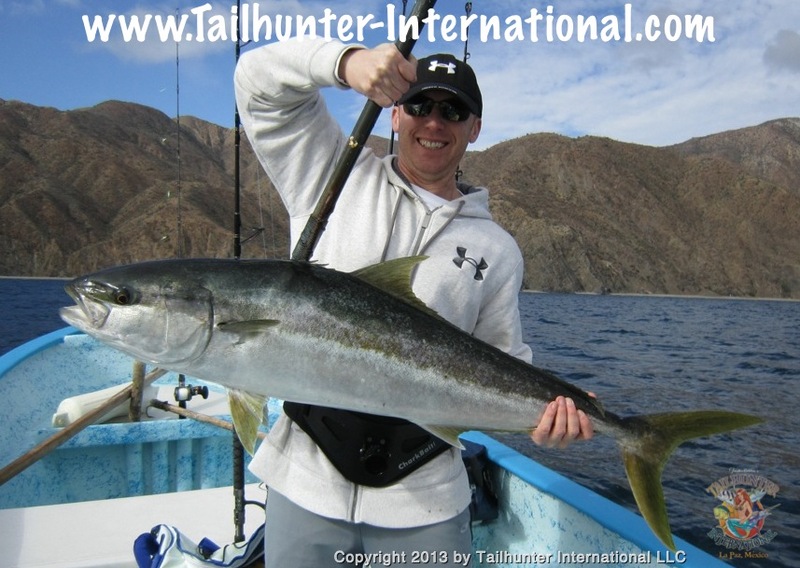 This is what you call a “mossback” yellowtail…thick fish with the dark back! Big smiles and a heavy gaff from Leif as he sticks the fish. That’s Cerralvo Island in the background. 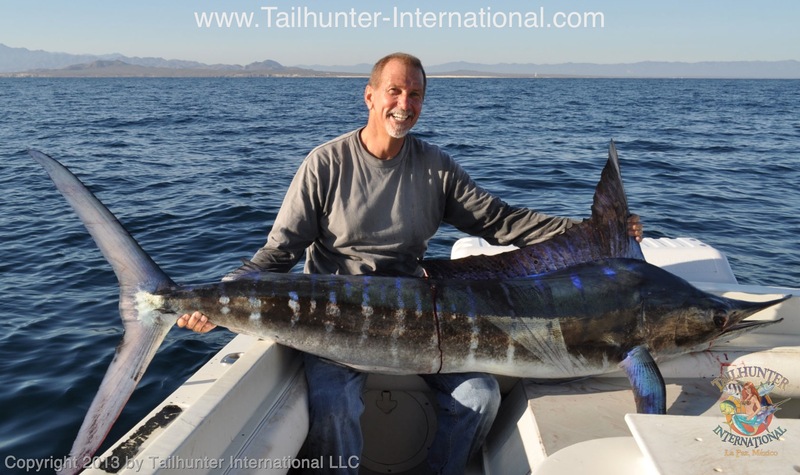 Roger Thompson is one of those guys who has great ju-ju when he fishes! We normally don’t see billfish until the spring, but both striped marlin and sailfish are already in the area and already eating! Several of our fishermen took several this week. Roger was out for yellowtail when he stuck this nice striper. They were unable to let it go and cooked it up for everyone! Brian did this yellowtail the hard way! He was using a sabiki rig (light tackle multi-hook rig used to catch bait) to catch mackerel to fish for yellowtail when this nice yellowtail crashed the rig and left Brian gingerly trying to get the fish back to the boat ! He and the fish went at it for more than 1/2 and hour before he put the fish on the gaff! Good job, Brian! 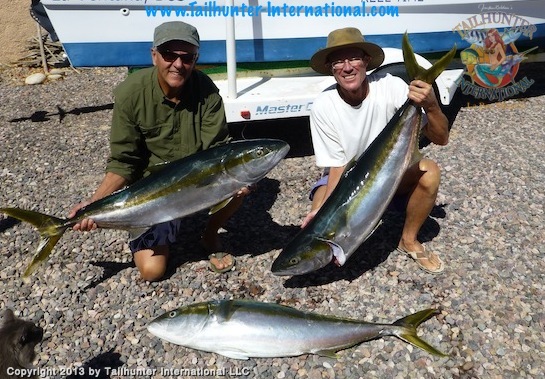 Gary Morris and his buddy, Graham live in El Sargento/ La Ventana and they took a day and got into the yellowtail bite too! Great eating! Tailhunter heads to the Boise Sportsmens Show this week, but we wanted to thank everyone who came to chat at the booth including our best amigos, Tim and Taylor Torres who drove in from Las Vegas to see us! Tim and I used to be neighbors and hadn’t seen each other in about 25 years! 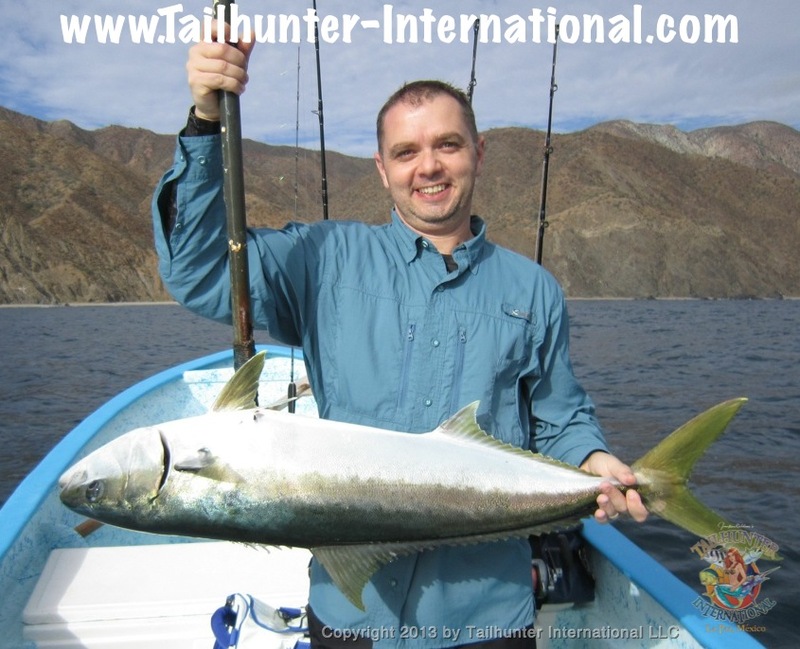 They’re going to be coming to fish with us in La Paz! We signed up alot of new folks who’re coming to visit us in La Paz in 2013. 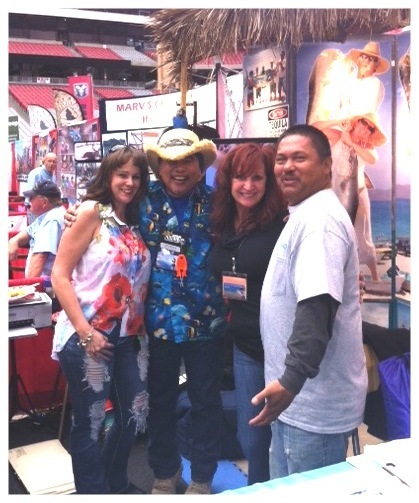 Great show and a great time in Phoenix! BIG YELLOWTAIL PLUS MARLIN AND SAILS BLOW UP AROUND CERRALVO ISLAND! Probably the best fishing week of the season! It was pretty much wide open fishing around Cerralvo Island…at least for a few days…then it shut off for a few days…then went crazy wide open again later in the week! Again, the winds…or lack of them…were the key! In the best yellowtail bite of the season, 20-40 pound fish ripped into pretty much everything that hit the water…live mackerel…dead mackerel…jigs and lures! 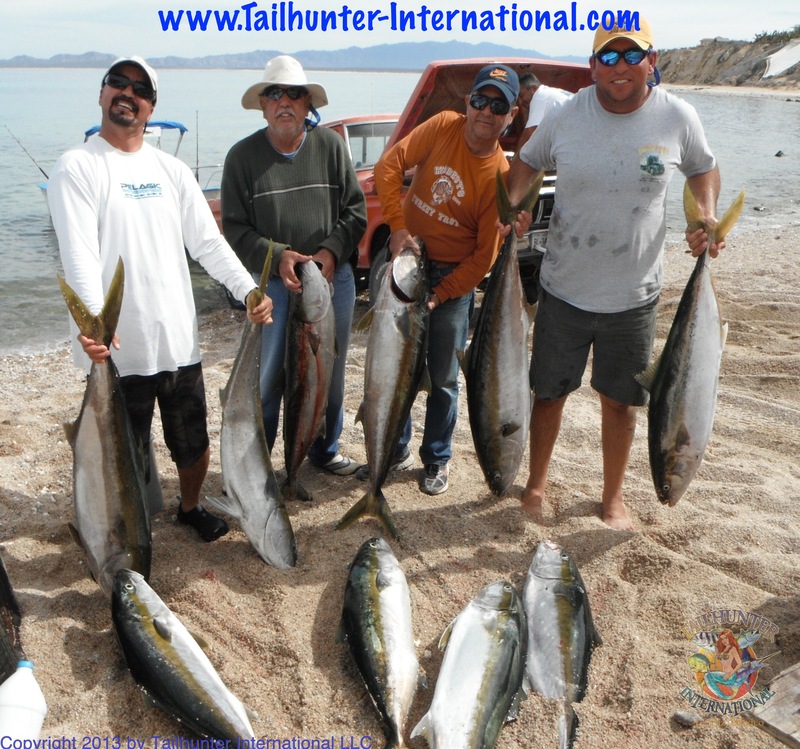 Our own pangas fishing from Bahia de Los Muertos as well as pangas from La Ventana and El Sargento pulled up with commerciall pangas and private boats to jump on the bite. “Can’t wait for tomorrow, these suckers are back breakers but fun as hell!”, he added. The key was to get there early and get the live mackerel before too many boats got on the spots or the winds started to pick up. If you had the live “candy bait” mackerel, it was instant bendo. But, even if you had the dead bait, the big fork tails would jump the hooks. We had some guys even get bit while they were using their sabikis to catch mackerel! (See the photos of Brian O’Neil above!) These were solid stocky fish and about 30 percent of the fish were lost. However, in addition to the mackerel, surprisingly no one told the billfish that it’s winter! We had one of the nicest bites of sailfish and striped marlin that we’ve seen in quite awhile! Even for prime time…and this isn’t “prime time”… but no one told the billfish. We had one panga hook 6 stripers in one day catching and releasing 2 and losing 4 others. Some of the other pangas were also hooking them in several areas all around Cerralvo Island and even more surprising, there was a big school of billfish right off Punta Perico which is about 100 yards from the beach and about 3 minutes from where we launch our pangas! If you couldn’t get the mackerel, sardines were blowing up the dorado (they didn’t hear that it was winter either!) as well as pargo, sierra and cabrilla. Later in the week, the winds came up again and the bite quieted somewhat, but then this past weekend hit and the winds went flat. Sure enough, the yellowtail came up for the chew and blew up again! We’ve not had a yellowtail week like this in a long time! FOOD: We’ll do the buffet at La Concha and we’ll do a taco feed at Tailhunters (if everyone wants) . April 12th is Jill’s birthday so we’ll have live music that night too! Beyond that, we’ll go out every night and whoever wants to go is welcome!